LinkedIn has finally decided to do away with their present homepage design and are bringing in a much more simpler interface which promises to enhance your LinkedIn experience. Yes, LinkedIn has the power to help you connect with people you should know. But a messy interface makes it harder for people who want to leverage LinkedIn’s networking potential. I always found its homepage cluttered and it was a pain to navigate through the site. This was the reason precisely why I made most of my professional contacts on Twitter, which I found easier to use. Going by what LinkedIn promises, I believe you will find the LinkedIn experience much better. In a way, it does resemble the Facebook News Feed but I don’t mind that. If it makes my stay at LinkedIn worthwhile, why would I complain? 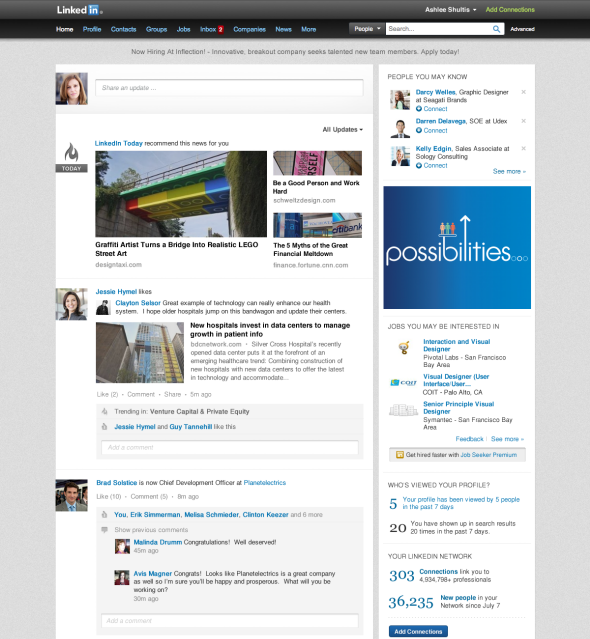 The LinkedIn homepage has been given a new look which makes it easier for you to find out what you are looking for. It looks easy on the eyes, less cluttered and promises to be easy to navigate. The predominantly white homepage will now have a hint of black on top (navigation bar) and a grey background. The homepage will have two columns: the update stream, where you can see the activity of all your connections, and the right sidebar, where you can checkout new people to connect with, job openings and Groups/Companies that might interest you. Unlike Facebook which has dedicated its entire right sidebar to ads, LinkedIn shows just one ad block. Surprising, isn’t it? I wonder how it will help LinkedIn’s revenues. What I like the most about this update is the way LinkedIn Today has been integrated with the update stream. The aim is keep the most relevant and informative update on top so that you can easily keep a track of what’s hot in your niche. The content of those updates will be decided by trending topics and what your connections are reading and sharing amongst themselves. PS: Do checkout the page for LinkedIn Today as well. It has been given an entirely new look. The update stream will now be pleasant to your eyes. And, this is where you will find the glaring similarity between LinkedIn and Facebook; the ‘Liking/Commenting/Sharing’ are very Facebook-ish. But, the best addition here is the self refreshing nature of the update stream. You don’t have to click to see new updates anymore. The new Homepage has just started rolling out, so it might take some time for you to see the ‘New LinkedIn’. And the good news is that this is just the beginning; LinkedIn promises that there will be many more updates to come which will greatly improve your LinkedIn experience. This new interface has surely got me hooked. What about you?